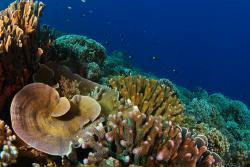 Healthy corals and planktivourous fish on Millennium Atoll, Southern Line Islands: Photo credit: Brian Zgliczynski, SIONew work (https://doi.org/10.1016/j.cub.2018.08.057 ) shows that corals living in waters more naturally rich in phytoplankton rely less on gaining energy from photosynthesis via their symbiotic algae and instead gain more of their energy from predating on plankton and other microorganisms. This could mean that those reef areas richer in phytoplankton could be more resilient to disturbance events like coral bleaching, as the corals have a more abundant alternative food source. The researchers linked the feeding habits of reef corals in the central Pacific to gradients in phytoplankton – which they measured using a satellite that tracks ocean colour. They then tested how well their model worked by taking previously published data on the feeding habits of corals across numerous oceans and showing they could accurately predict them using their satellite-driven model. How much and what corals eat has been a critical knowledge gap in coral biology. The information is essential for understanding how corals are likely to persist in a warming ocean. 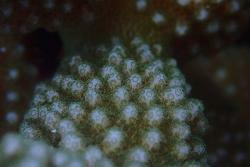 Close up image of the individual polyps of Pocillopora meandrina on Palmyra Atoll. : Photo Credit: Michael Fox “Feeding can also increase the reproductive capacity of corals, which is key to repopulating reefs that have suffered high levels of coal mortality,” said Michael Fox, the graduate student from Scripps Institution of Oceanography at the University of California San Diego, who lead the research published in Current Biology on October 18. “What we now have is a map of potentially more resilient coral reefs. If these corals are relying more on planktonic food, perhaps they can recover from coral bleaching events faster,” he added. “Our study is the first to take our understanding of coral feeding outside of the lab and show that global patterns of food availability likely influence the health and resilience of coral populations around the world,” said Jen Smith, Professor of marine biology at Scripps and co-author of the study.